The night before the deadline, I finally decided finished was better than perfect! I really wanted to submit *something* instead of *nothing,* so even though I didn't think I had the perfect idea, I got started anyways! I cut the four Our Yard prints and two of the solids into bias strips. 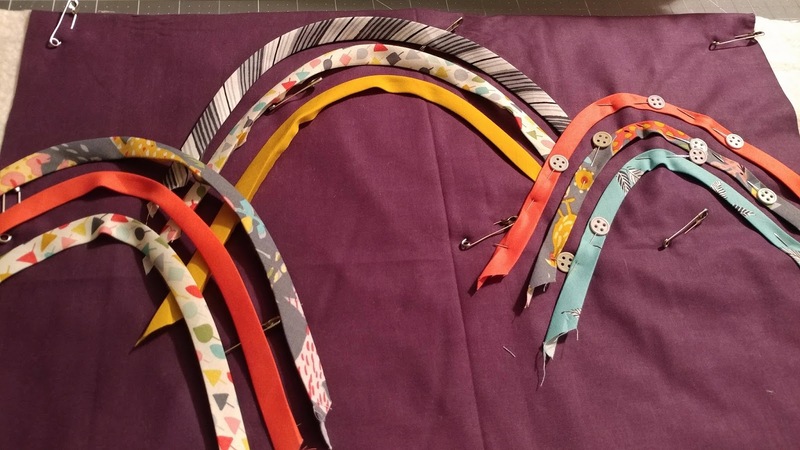 I used my 1/2" bias tape maker to press them into strips, then I pressed the strips into "hill" shapes. 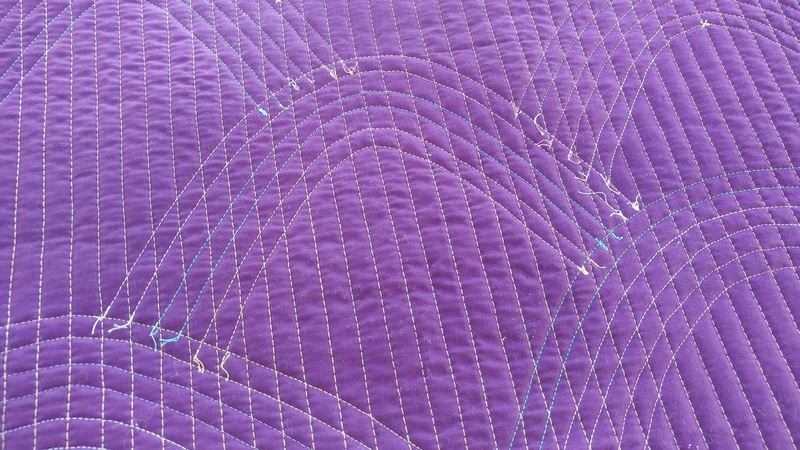 I made a quilt sandwich using a half yard of Cotton Couture plum (so both the front and back are plum) and Warm 100 batting by The Warm Co., then pin basted as usual. 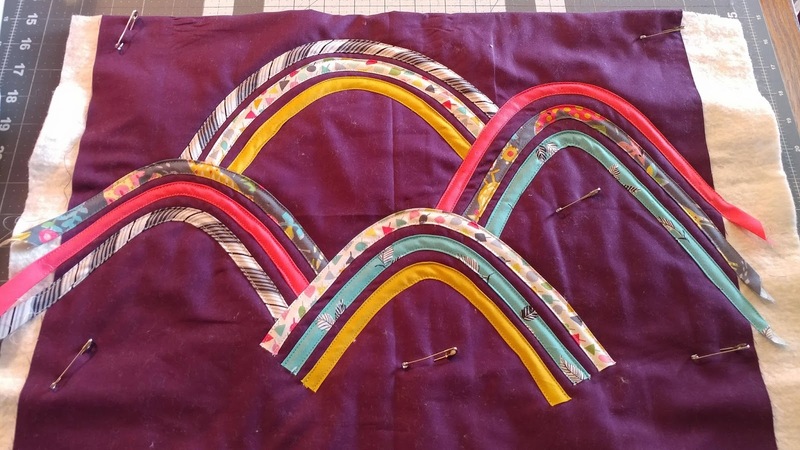 Next, I arranged three strips to make each hill and pinned in place. Once all the hills were stitched in place, I realized that one hill towards the bottom right was really lopsided. But I really didn't want to unsew it! So I decided it would just have to stay. 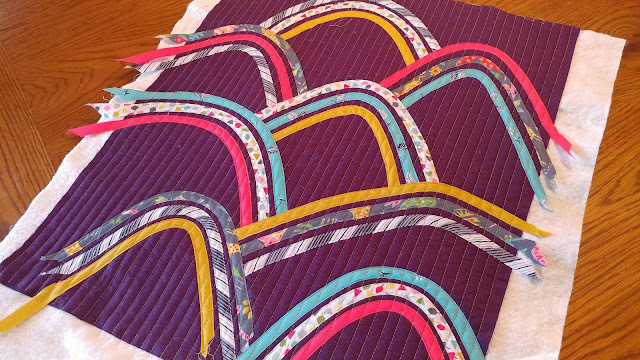 Since I sewed through all the quilt layers when sewing the bias strips on, additional quilting wasn't really needed. However, visually, I wanted to add more quilting! I used Aurifil 50wt #2920 Light Brass and my walking foot to stitch vertical straight lines over the quilt. They are about 1/2" apart, but I just used the edge of the walking foot to space the lines evenly. I entered the quilt in the fabric challenge category for QuiltCon. It is $15 to enter a quilt. 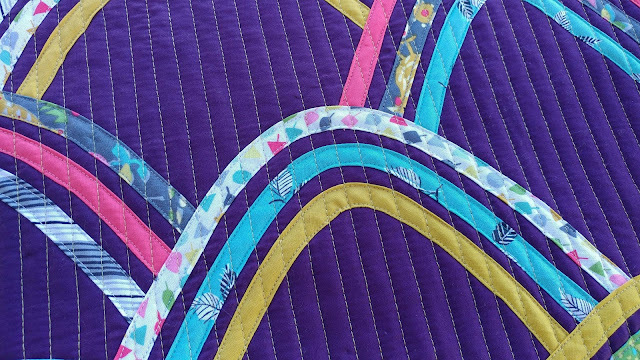 When submitting the quilt, you can choose if the quilt is for sale. I decided to go ahead and say $95. 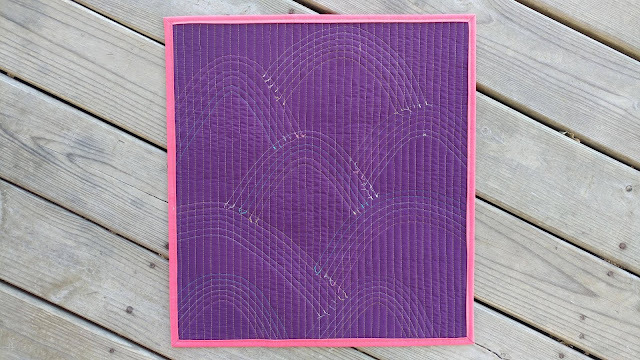 It's just a mini quilt, but once you take out the 15% that The Modern Quilt Guild keeps, my entry fee, and shipping to get it there, there's not much left. Many things to consider next year! 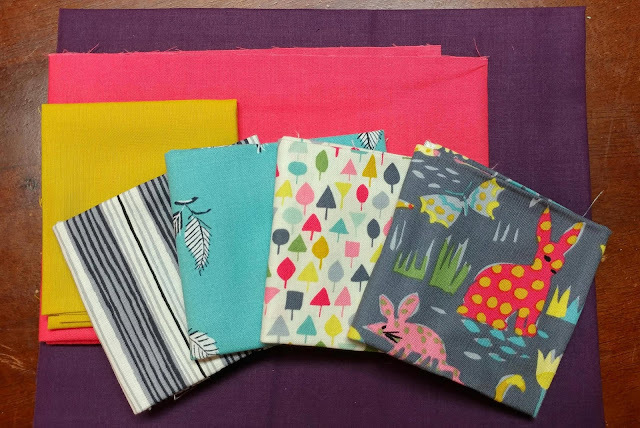 In April, I made "Rough Around the Edges" for the Modern Quilt Guild's Riley Blake Fabric challenge. I didn't win a prize in that challenge, but that doesn't stop me from trying again! 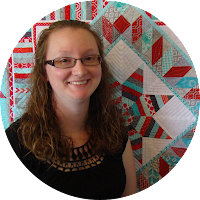 This was my first time actually submitting a quilt to QuiltCon though! 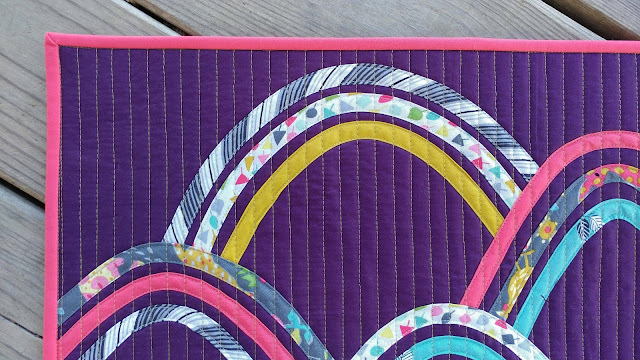 I generally make quilts to be used and loved, not for shows. 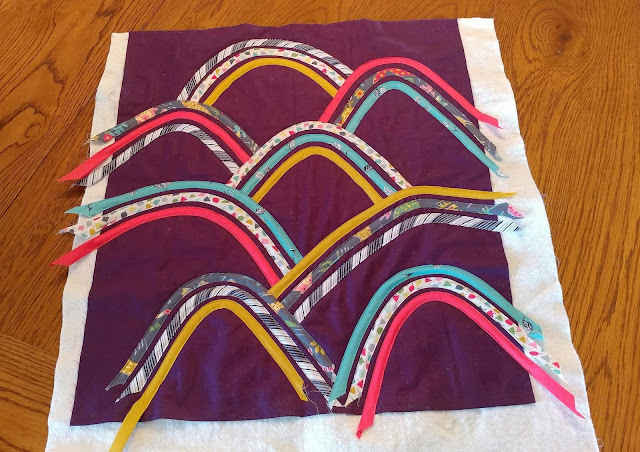 I'm not expecting to win anything with this one either, but it's good to learn the process of how to enter so I can be prepared if when I enter a quilt next year! 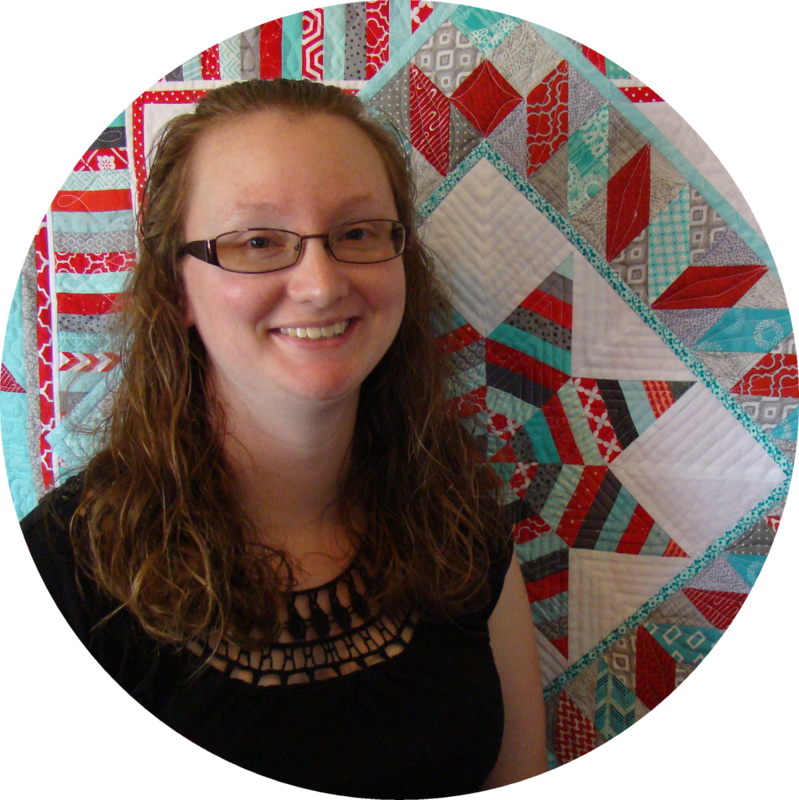 When submitting the quilt, it asks for a quilt title and an artist's statement. I titled the quilt "The View From Here" and wrote, "Using bias tape strips, I created the rolling hills (aka Ozark Mountains) that are in "our yard." The imperfect shapes represent the hills where cattle graze, deer play, and my family calls home." 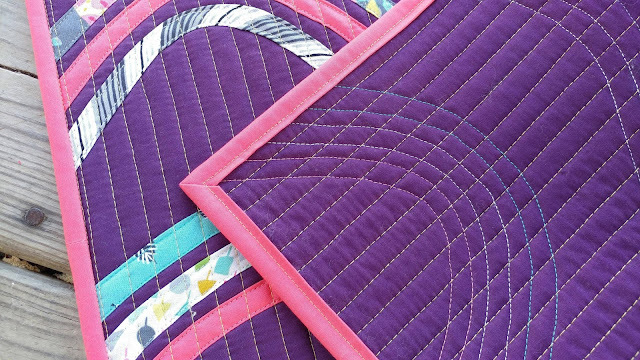 Have you ever entered quilts in a show? I've never taken quilts to my local fair or local quilt show! Maybe 2018 should be the year! 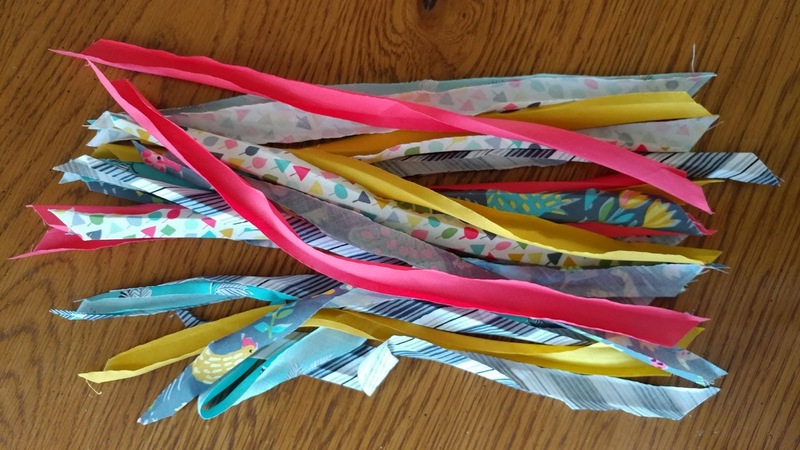 Linking up with Finish It Up Friday at Crazy Mom Quilts, Finished or Not Friday at Busy Hands Quilts, Can I Get a Whoop Whoop at Confessions of a Fabric Addict, and TGIFF at Faith and Fabric. This post contains affiliate links. Clicking a link will NOT change the price. I love what you did, and I also love your idea of not letting being perfect get in the way of doing this and finishing it AND being pleased with the result! (I hope I am not reading too much into your actual words!) Very cool. 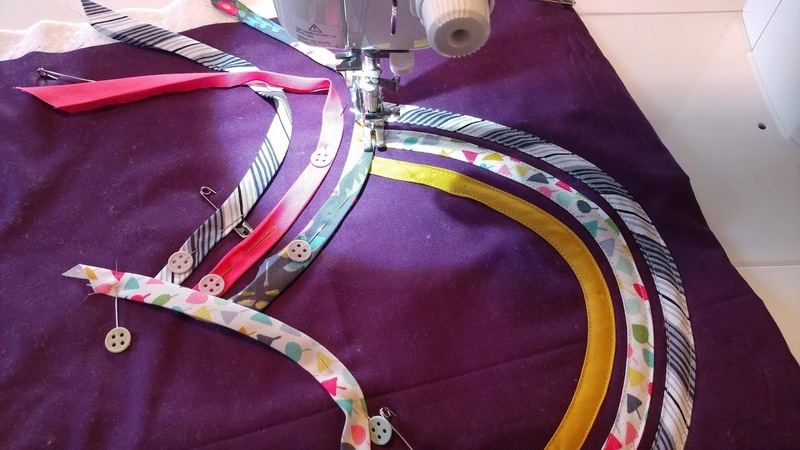 Quilts have won ribbons at QuiltCon with beautifully done machine binding; the only thing that matters is how WELL it is done (not HOW it is done). :) I really like your idea and how your statement connects back to the challenge as well! Congratulations on your first submission. I look forward to seeing many more (and yes, I think 2018 would be a great year to entry your local venues)! I love it, it's so creative and adorable! I hope you are able to get in, because I'll get to see it in person! Pretty fabulous finish...thanks for sharing pictures of your process and good luck!! Wonderful depiction of your mountain home!! Nice use of bias to design. As to the bottom "lopsided" mountain, nah. Artistic variation. 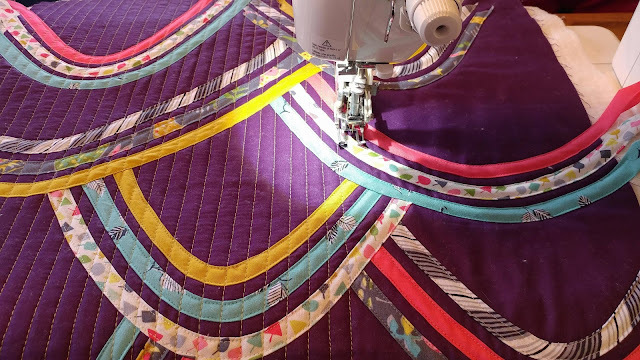 Here's hoping QuiltCon likes it too. I once heard a show director's speech; she said, "Every quilt in the show was entered." I'm all for entering. So creative with the bias and love that it represents your home! That stripe on the bias is my fav! Yay! I’m so happy you entered it into QuiltCon. 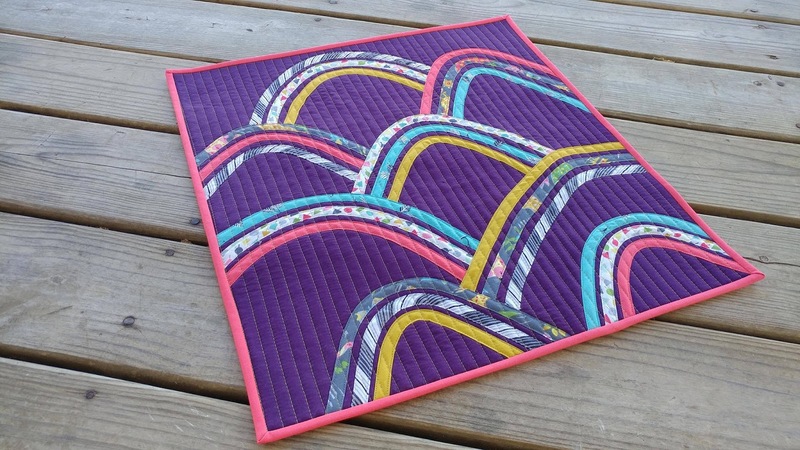 I really love the landscape and the vertical quilting adds depth, very cool! I’ll keep my fingers crossed for you. Great! You are wonderfully creative. I hope this gets in. You made such a pretty quilt! 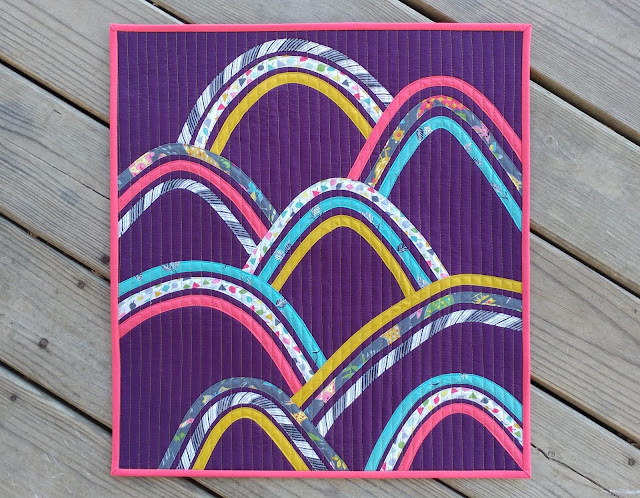 Great idea to make the bias strips and use those for your mountains!